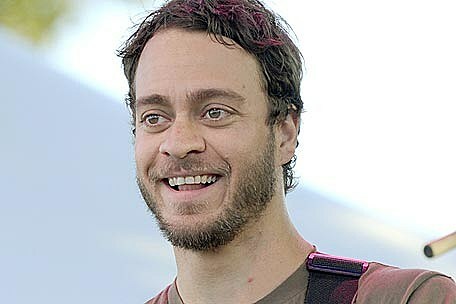 Singer/songwriter Amos Lee has toured with everyone from Merle Haggard and Bob Dylan to Paul Simon and Elvis Costello. So it comes as no surprise that many country artists respect the Americana/folk artist. Lady Antebellum's Hillary Scott is one of Amos' many country admirers, along with Willie Nelson and Lucinda Williams, who lend their voices on his upcoming album, 'Mission Bell.' "Great songwriters don't come around that often. Amos is an exceptional artist, a true story teller, unique to his generation," says Willie. While 'Mission Bell' isn't due for release until January 25 of next year, Amos filled The Boot in on the recording process, his Farm Aid performance and just how he recruited Willie to join him in the studio. How is 'Mission Bell' different than your past releases? I had a different take on it. I went to Tucson and recorded with a band called Calexico, who have a sound all their own. I opened myself up to that situation and to music that they make and to their approach of making music and I learned a lot from it and grew a lot from it as a musician and an artist. I walked away from it feeling really positive. I think the record is solid musically. You have some pretty notable guests on it, including Willie Nelson and Lucinda Williams. How did you recruit them? I have a connection to Willie. There were a couple songs where we wanted to have some other voices. I never really had guests on my other records; it's always just been me. I had Norah [Jones] play on my first one and Lizz Wright. On the last record, I didn't have any other people singing on it with me. I never had anybody take a verse on one of my songs and we were thinking of people that would sing the songs well and represent them well. We just put it out there to go to the people who we love and respect the art that they make and the way they approach their careers. We were very fortunate to get everybody. I'm inspired by the situation. Songwriting isn't always something that's directly proportionate to the experience. I hope that they're [the songs] open enough that people can understand and feel whatever it is that they want to feel. That's the beauty of music, that it's abstract in that way. It's not always super literal. What was it like performing at Farm Aid in front of thousands of people? I felt pretty good about it. It's amazing to be able to sing and play into such an open space. There were a lot of people there, so the reverb was really wild and the sound was really immense. It's amazing to be able to open yourself up to that sonic power. It's such an expansive thing to be able to be onstage with your guitar and to have such a broad, sonic way to work. That's inspiring sometimes because it gives you a whole new way of looking at singing. If it were me and you in the room here, you would feel the song but it's almost like there's so much more breath that just exists because of the space. To be on a bill with all those people, you want to do good. It's kind of what you normally do, but in front of 20,000 people. It was fun. I really enjoyed it, and I felt really lucky to be there. The issues Farm Aid is trying to broaden people's understandings of are really important. Understanding where your food comes from, trying to bolster local farmers and local economies and having a better connection to the food around you and the people around you, only good can come of that. I love to be involved with things like that. What's going on through your head while you're performing? A billion things, it depends on when and where I am. The lyrics behind 'Ease Back,' on your last album, 'Last Days at the Lodge,' are striking. What inspired the song? It's a song of reconciliation. Taking the situation, being removed from the hurt for a little while, you get so much clarity. I think most of the time when people have big disagreements and big misunderstandings, when time lessens that blow it creates a deeper understanding for both people. You've hollowed out a lot of the brick that was between you and there's light that shines into the situation. It's a song of reconciliation first and foremost. Coming to the realization that people make mistakes and no one is perfect. Do any songs mean more to you now than when first written? I don't think so. When you write them, it's the pinnacle of a lot of things. When you finish a song, you feel great. The first time playing it by yourself is pretty special. It's a really special feeling to be able to get something out that you didn't know was there in the first place. Every time I write a song I feel really lucky and kind of surprised. Not surprised that I wrote it, but just surprised that things exist that you don't know about. You can't even fathom most things. Willie Nelson has raved about you, saying you're "an exceptional artist, a true story teller, unique to his generation." I don't think Willie is BSing anybody. I don't think he has to. I'm incredibly humbled that somebody like Willie even takes the time to listen to any of my songs. He doesn't have to do that. He's written some of the greatest songs ever. For him to even take the time to listen to anything that I've done is beyond comprehension for me, because I never would have thought that that would be possible. He's Willie Nelson, what can you say?